Officials say they are no longer actively searching for the plane carrying Argentine footballer Emiliano Sala that disappeared from radar on Monday. British officials say they are no longer actively searching for the plane carrying Argentine footballer Emiliano Sala that disappeared from radar on Monday near the British island of Guernsey. A three-day air-and-sea operation, covering 1,700 square miles near the Channel Islands, off the northern coast of France, has failed to locate the aircraft or the two people on board, Sala and pilot David Ibbotson. The plane was flying from the French city of Nantes to Cardiff, where the 28-year-old striker, who signed for Cardiff City at the weekend, was due to start playing for the Welsh capital's Premier League club after a club-record transfer was agreed. "We reviewed all the information available to us, as well as knowing what emergency equipment was on board, and have taken the difficult decision to end the search," police on Guernsey said in a statement. "The chances of survival at this stage are extremely remote." Guernsey harbour master Captain David Barker said on Thursday the search team has "taken the difficult decision to end" the operation," adding the "chances of survival at this stage are extremely remote." Next of kin have been informed, officials confirmed. The police said teams from the Channel Islands, the United Kingdom and France had searched an area of approximately 1,700 square miles (4,400 square kilometres), "with a significant amount of this searched more than once". Sala, who signed on Saturday from for a reported fee of 17 million euros ($19.3 million), was flying to Cardiff in a single-engine Piper PA-46 Malibu aircraft. "I'm on a plane that looks like it's going to fall apart," the rising star said in a WhatsApp audio message from on board. Police earlier said rescuers had spotted "a number of floating objects in the water" but had not been able to confirm whether these were linked to the plane. Football agent Mark McKay confirmed Thursday he was involved in making the travel arrangements for Sala between France and Wales through the player and his agent Meissa N'Diaye. "I began to look into arranging a private flight to take him to Nantes on Saturday morning," he told Britain's Sky Sports News. "That evening, it was confirmed a plane was available to fly Emiliano on Saturday which could remain in Nantes until he was due to return to Cardiff. I have been in contact with officials from Cardiff and the player's agent over these difficult past few days and will continue to do so." In Sala's Argentine hometown of Progreso, his father Horacio told the press on Tuesday that the wait for news "makes me fear the worst." 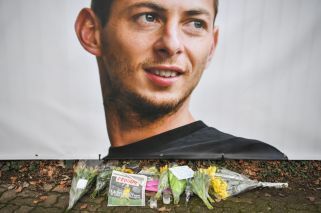 Flowers and scarves were laid outside the club's stadium. Tributes were also paid to Sala at several French Cup matches this week, while his former Nantes teammate Yacine Bammou raised his hands towards the sky in an emotional celebration after scoring for Caen on Wednesday.